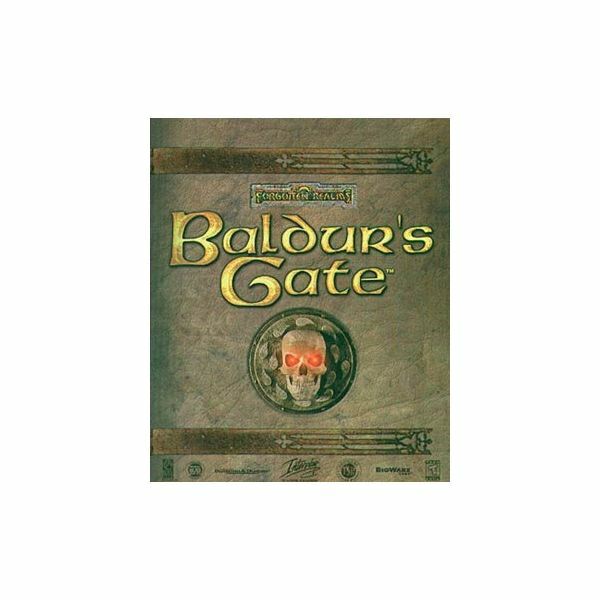 I have been gaming for a couple of decades now, ever since the days of the Atari 2600, and I consider the Baldur’s Gate series of games to be among the best role playing games ever made. When the first Baldur’s Gate game was released, I was playing D&D quite regularly with a bunch of friends, and we all jumped into the game because of its excellent party-based tactics and strong storyline. Although the game may look a little dated by today’s audio/visual standards, it still holds up well. Baldur’s Gate is set in the Dungeons & Dragons world of Forgotten Realms, and there was even a paperback novel released to coincide with the game. The game was made using the 2nd Edition ruleset of the D&D game, and built using the Infinity Engine that would be used on several other similar D&D-based RPG’s. It was developed by a group called Bioware and released by the now defunct Interplay Entertainment in 1998. It won Game of the Year and RPG of the Year in 1998 from several different gaming magazines and websites, including PC Gamer and IGN. The story begins with you playing an orphan living in a place called Castlekeep with your redhead friend Imoen. Your adopted father, Gorion, is a powerful wizard who seems to know a little more about your origins than he cares to admit. In an early cutscene in the game, Gorion is killed, and this leaves you and Imoen to go out on a grand quest in search of his killers and performing many side missions along the way. You’ll also pick up new members of your party and visit all kinds of interesting locations. This game is played using a real-time system where you’ll need to hit the spacebar a lot to pause the game and assess the situation. You control a party of characters, with each having their own strengths and weaknesses, and it’s how you use the party that makes the game such fun to play. If you’ve ever played a real session of D&D, then you’ll know the importance of having a well-balanced party. You need to have fighters who go up front and take the hits, plus you’ll need clerics who can heal and spellcasters who can do damage from afar. It also helps to have some rangers or rogues who can stand back and shoot arrows at bad guys, but still whip out a sword when needed. By today’s standards, the graphics on this game look archaic, but they were great back in the day. It originally only supported a 640×480 resolution, though some patches have been released to increase them. Even at the lower resolution, I thought the design of the characters, monsters, and environments all fit right into the D&D look. Besides, this is the kind of game where the gameplay is so superb that you can forgive somewhat lackluster graphics. The soundtrack is great with its orchestral movements and there are tons of different voices used for all the people you meet in the game. The game is presented using an overhead view very similar to that of Diablo, and you travel to different areas on a huge map. Some areas do not come available until you’ve completed certain tasks, and this is so you can’t jump too far ahead of things. When a spell is cast, you get graphics that look a lot like the spell should, and this way it helps to tell what spells are being cast against you. The game also employs a ‘fog of war’ type scheme so that you can tell where you’ve been and where you haven’t. I’ve run into a few stability issues playing Baldur’s Gate on a Windows XP machine, but I have not tried it in Vista. This game came out while many people were still using Windows 95 or just getting into Windows 98, so keep that in mind before you buy it. Also, you should get on Google and search for the latest patches for the game, because a bunch of updates were made since its first release. Despite a few technical glitches, I still think Baldur’s Gate is one of the best games ever made, on computer or anything else. Be sure to check out the Tales of the Sword coast expansion pack, which adds some new areas and other things to the original game. I only played the expansion briefly, and founds parts of it to be very difficult, but it could be my characters just weren’t yet ready for that kind of challenge. Addendum: At one time, a version of this game was being developed for the original Sony PlayStation game console, but it was scrapped. You can still find some game test footage on Youtube and other sources. There was, however, a couple of Baldur’s Gate: Dark Alliance games released for the PS2 and Xbox, but they were pure hack and slash and have very little resemblance to this PC RPG.